My first year roommate played “Swing Swing” by All American Rejects over and over and over again on repeat. That was basically like sucking out my soul... so I can appreciate Buffy’s position. I still can’t listen o that band without having flashbacks. Jam just post it anywhere you’d like it’s pretty casual around here. If you want to find a good thread there is actually a video request thread somewhere around the boards. I’ve seen it. Evil! You probably iron our jeans! Maybe the reason I've never had terrible roommates is that I'M the bad roommate! It all makes sense now. I can't stand this episode. I can't find any redeeming qualities about it. It does nothing for me. Whatever it tried to do it failed miserably. 2. How do you feel about Doyle's justification for charging clients who can afford it? I don't like the idea of Angel charging for helping people. I don't understand why they made that a thing. Couldn't they have just been like Angelus had a trust fund, let's use blood money and put it to good use. They stop putting an emphasis on charging people after season 1 for the most part and I appreciate that drifting away from that because it's weird. But as far as excuses go, I think Doyle comes up with a good one. 3. Does Dr. Meltzer creep you out? He is such a lovable dork. And also he looks great in that light beige sweater. Oh you see, there I found a redeeming quality of this episode! 5. Anything stand out on rewatch? What even does this mean? How is this at all related to Angelus? Ok maybe Angelus does have alot of rage in him, that I buy but he is so messed up he can't deal with a "real woman," what was Darla? And also, when Angelus saw Dru or Buffy he saw how "useless" and "damaged" he was... give me a break. That demon had no such moment of self-actualization. I don't understand how this is supposed to fit with Angelus' profile. Maybe my read of Angelus is all wrong but I see Angelus as someone who relishes in the pain he inflicts on others. I don't know that this is what I saw with this doctor. This doctor obviously deluded himself into possessing the woman he didn't want to destroy her/drive her mad. If you ask me the doctor sounds more like Spike with that inherent need to possess and the idea that he is entitled to her. I think the writing in this episode was an epic failure. I'm not sure where they thought they were going with this. And this story is Joss and Greenwalt which feels so weird. I'd really like to know if anyone else found this connection/parallel between this doctor and Angelus convincing and if so I'd love to hear that analysis because the whole thing falls flat to me. I'm sorry for being so negative about this one. I usually try to find something good but this one does nothing for me. I like this episode enough. I think it's funny. I think I enjoy the comedy bits more than the "dramatic" elements of it. Like Cordelia tearing up linoleum, and the shopping for creepy apartments. The Doyle stuff doesn't work for me. It's far too vague and it never goes to any real place. 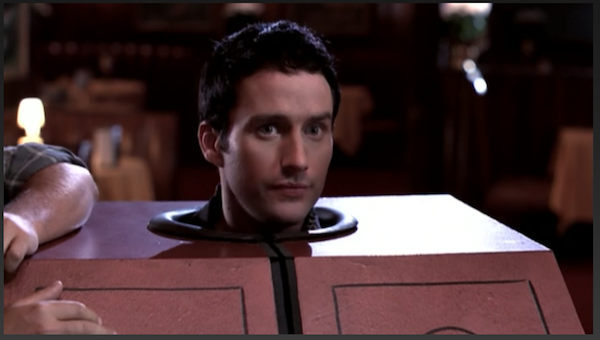 And I really don't like the way that Doyle is trying to "woo" Cordy. Doing something for her so she is grateful and that she'll - what? - want to sleep with him. I don't think Doyle is a bad guy, but he needs to be set straight on a few misplaced notions. 2. What do you think of Angel's developing friendships with Doyle and Cordelia? I think Angel understands Cordy a bit more after this episode. Angel thinks that maybe somewhere buried deep deep deep down she may want to change her ways. Maybe she wants redemption? I don't think Doyle and Angel's relationship is advanced in any major way but I like that Angel cares about him enough to intercede. I enjoy this episode because it's about the team not about some random third person like I Fall to Pieces or Lonely Hearts. This is a family episode and this is sorda what AtS goes on to become - which is where I think the show does best. 3. What's your opinion of the infamous "whiny little cry-Buffy" line? I'm not really on board with the episode's seeming endorsement of Cordelia's brand of bitchy. Self-confidence is good, but the fact that she has to put Buffy down to feel good about herself is eye-rollingly typical of her. ^^ What Grace said... except I'd probably use curse words. As I've said before, half naked and wet Angel holding Louis Vuitton is basically every major fantasy I've ever had. I love when Doyle tells Angel he has an overhanging forehead and Angel touches his forehead hahah. This part always cracks me up: When the ghost is typing DIE and Cordy says: “Hey, maybe it’s not done. Maybe it’s ‘diet’. That’s friendly. A little judgmental, sure." So it's basically canon that Cordelia is kind of a slob right? This goes back to City of, and Lonely Hearts and then her apartment is a mess here, and then she eats peanut butter in bed at her friend's house and gets it all over the bed? Just add that to the very long list of reasons that Angel and Cordelia are not compatible. The script calls for Angel to be listening to Beethoven on a PHONOGRAPH. I want to take a moment to personally thank whatever person on the show was like "guys we are over doing it... vinyl will do just fine." And honestly, Angel listens to Ode to Joy?? He strikes me as more of a Beethoven's 7th kinda guy (specifically the kinda guy who puts the 2nd movement on repeat) but ... maybe he wanted a pick me up here. The way that Dennis died is incredibly horrific. Anyway welcome to our newest character on AtS - Phantom Dennis! 2. How do you feel about the way the episode presents Kate and Angel? 3. Do you think the theme of this episode fits well with the Buffyverse? Overall thoughts on this episode? Sensitive!Angel and Undercover!Angel are hilarious, but otherwise I pretty much hate this episode. How do you feel about the way the episode presents Kate and Angel? Ugh, the vicarious embarrassment I feel for Kate is enough to make me dislike this episode on its own. But I'm not sure what this episode wants me to take away, either. I actually don't think it's OK for police officers to physically abuse people in their custody. So if the message is that people getting abused is better than the cops being "sensitive," I'm not down with it. Cordelia's complaints about Angel seem overblown compared to his past behavior this season. I don't know if it's supposed to be a "be careful what you wish for" for Cordelia, but I think the idea that Angel doesn't actually need to be any more sensitive than he is works better than whatever message they were going for with the cops. Do you think the theme of this episode fits well with the Buffyverse? I don't know. The message is confusing and possibly terrible. My new personal head canon is that Tim Minear was forced to go to anger management class at some point and was completely resistant to it and this episode is the result. Tim Minear was already an experienced staff writer, a veteran of The X-Files and ABC's romantic comedy take on Superman, Lois & Clark. About a year earlier, he had met with Joss on Buffy and pitched some ideas. ... While Joss was "blown away" by Minear's talent, his demeanor during the pitch convinced him that Tim Minear was the angriest man he'd ever met. Joss felt that he couldn't spend a significant amount of time in a room with someone so full of rage. On Angel, however, Joss had given David Greenwalt his blessing to run the writers' room as he saw fit, and Greenwalt wanted Minear. However, Minear was not terribly keen to do Angel. "I frankly didn't think it was that good," he says. "I didn't think it even remotely compared to Buffy -- it felt like a pale knockoff to me." Obviously, Tim Minear eventually decided to take the job. But he and Joss hated each other at first. Before the drama of breaking "Hero," the staff had watched the cut of [Sense and Sensitivity] together. Joss declared it unairable. "Great," Minear says. "The first episode that has my name on it, Joss Whedon feels like it's the first episode in the history of Mutant Enemy that is so bad that America must never see it." Minear had asked to sit in with the editor and work on a new cut of the episode. At the time, it was rare for writers to regularly go into the editing room. They did a tremendous recut, and everyone felt that the results were actually pretty good. Minear himself felt that it never got great, but it definitely got better. Later Greenwalt would tell him that Joss said that he had done a great job and saved the episode. "Well, what's that old saw, about picturing your public in their underwear?" / "Way ahead of you." "My parents were great. Tasted a lot like chicken." "You could be a rainbow and not a painbow." Anything stand out on rewatch? There are definitely some cute moments between Angel, Cordelia and Doyle in this one, despite my many complaints. 2. Did you like the Doyle backstory we got? 3. What do you think of the parallels between Doyle/Harry and Angel/Buffy? Overall thoughts on this episode? I really enjoy this one! It gets a little draggy in parts, but overall it's fun. I like learning more about Doyle. I like the actress who plays Harry. I like Angel being sweet (and breaking down the door when necessary, of course). What do you think of the parallels between Doyle/Harry and Angel/Buffy? I really liked the way they decided to use Doyle to give us some B/A parallels ahead of IWRY. I especially like the way they draw out the idea that Harry could accept Doyle's demony-ness but he couldn't accept himself. "Harry didn't leave because of the demon in me. She left because of me" has a strong echo of "It's not the demon in me that needs killing, Buffy. It's the man." Doyle also talks about Harry's new fiancé being able to offer her a better life, and he says they broke up after they started talking about having kids (thinking about the future). Those are also parallels to the B/A situation at the end of S3. And I think we're supposed to be thinking about the reasons Angel left Buffy because the next episode is going to take them away (though only briefly, sigh). "Just don't tell Cordelia. She'll want to charge you." Anything stand out on rewatch? Angel asking about Doyle's effectiveness as a fighter while in human vs. demon face made me wonder if he was somewhat speaking from experience. Does it seem like maybe Angel sometimes held back in his fighting in S1/S2 of BtVS because of his dislike of vamping out around Buffy? Seems like it fits with his line in What's My Line at the ice rink and his comment about feeling judged when vamping out in Sense & Sensitivity. I like the way Cordelia and Angel looking at Doyle and talking about his upsetness over Harry is similar to Cordelia and Doyle looking at Angel at the beginning of IWRY. There are definitely some odd little things about this episode. Cordelia getting completely ready for a big date at the office instead of just blowing off work? Doyle somehow teaching third grade before he was 21? Also, I think if Harry had actually been to Kiribati, she would probably pronounce it "keer-ih-bus." I don't do real 'episode' discussion, much, or in the right place, as I read stuff, but am glacial in responding anymore. I do "slop around" in what is loosely considered "overview"--and maybe I like Tim Minear a lot==maybe I am angry(est) as well; but I also think his idea of horror is generally too shocking and awful (flesh made meat, for example--see AMerican Horror) and Stephen De Knight can't not show buckets of blood coloring every inch of everything. See "Rome." About money. It is an idea. It means no one has to do every single job from providing shelter, finding materials for clothing, finding food, finding the energy means to actually survive in regions of the earth that are inhospitable to our species for a longer life span and even to extend the hours of the day with light. It is constitutionally considered a “vote” of sorts in your choices for goods and services and is therefore protected “free speech.” The problem, of course, is that there is a difference between “getting and keeping.” The wealthy get more free speech in any given situation, especially politically, to garner influence and power the “keeping. which in itself “buys” more influence and power toward more of the keeping—and please don’t bother with the “unions,” having an equitable power of free speech. Less than seven percent of peoples have one and their powers (e.g. of freedom of assembly) are seriously gutted in places with “right to work/right to fail” laws. Further, because Liam/Angel/Angelus is old, he has seen everything “come and go,” as death is also a reality. Humans provide for means for “immortality” in * ideas *--which includes money, law, even forms of business who have been given the status of living organisms by virture they “change and grow and reproduce and often die.” All of which are ideas *describing * life, but not really utterly defining it. Many peoples on earth have attributed life to stones and water and air, etc for example. Others attribute a continued life, by virtue of the soul (traveling through or to) ‘other dimensions’ by many names. Therefore, having a wage to sustain ‘organic life’ needs does not mean such payments “make you care’ more in the life saving “business” when it is your life that is the actual ‘coin’ that is the final measure of your effort. It is when *you * decide that “keeping your place” requires other sacrifices to do so, and that is often called “corruption.” I argue there that one also has a duty to ‘potenial’ in life, and that means to the self to be an actualized human being, which means using your potential to its fullest possible expression—and that may be judged as “good” (increasing one’s knowledge/skills to advance to positions that enable better expression of that learning, for example) or “evil” –a suicide bomber. For Angel, I consider his wretched fear of death, as Liam; I consider Angelus’ balm on his soul to not care at all prices, for as an immortal, he would avoid “permanent death.” And last, the struggle of Angel to answer what is good, evil and the bridge (aka “corruption” or, on the other hand, “self actualization” (to be a mortal human being—actually rewarded with the “true peace” in death). And last, I have a real problem with people calling every activity “business” when the only measure of business is “profit”—not how that profit is spent. Or not. ATS made a point to show Angel moving from jeans to (Italian) light wools when in W&H as a sign of his corruption. “Presenting the self,” including the 3 inch carpets, is a “show” of success in law firms aka “winning,” but is also an extension of humans in “mating attractiveness” and therefore, power, as well. Humans who are in trouble feel better if someone shows confidence (in the intimate whisperings in the ear from even childhood) that “things will be all right.” Safety is a human need. Society (group) is a human need, yet humans also hold the power to harm, damage, destroy, kill. Thus, people order “behavior” through the means of undisputed traditions, dogma and law. Even for Angelus—who knew he would be cursed with actual * potential * in a soul? I can’t answer if the ‘soul’ is undefilable in this story. I figure in fanon that it remains “pure” as shown in the jar because it is God, of God, or of His Light. I try to enjoy this episode from a comedic perspective. But to the extent that it attempts to send a message - it doesn't work. Still I find it funny enough that I just enjoy the good parts. I love Herb Saunders! First, it's nice to get to see DB flexing some comedic range on his show. But also, from a character development perspective, what I find interesting is that Angel is actually very good at playing other people: Angelus in Enemies, the fake persona for the doctor on I Fall to Pieces, Herb Saunders here, the curator in She, Jay-Don in Shroud of Rahmon. I kinda think of it being easier for Angel to pretend, to some extent, to be someone else is easier for him than to have to be himself with all of the guilt and self-loathing he carries with him on a daily basis. It's actually my headcanon that BtVS s1 Angel from about Welcome to the Hellmouth to like NKABOTFD is kinda putting on a sort of vibrato of someone else. Not necessarily for some grand deception (although I don't think he wants to tell the Slayer he is a vampire and risk getting killed) but because I think he is uncomfortable with himself at the time. After Buffy finds out who he really is, about his past and appears to accept him anyway he seems to fall in line with the Angel that we know. Cordelia's complaints about Angel seem overblown compared to his past behavior this season. Yeah I would agree with this. I always found it kind of ironic that a character that is often seen as too sappy or sensitive on BtVS is JUST for this one episode supposed to be seen as distant/uncaring. He is quiet - that's true. And sometimes quiet can come across as not sensitive but, eh, the characterization doesn't work for me all that much. I also think there is a difference between being "insensitive" and "inexpressive" and this episode annoys me some for seemingly confusing the two. For example when Angel leaves Cordy and Doyle to clean up the demon goo without thanking them (although - technically isn't he paying them? Is he paying Doyle? Isn't that their job?... sorry side track!) that could be perceived as not being sensitive to their emotions etc. Whereas the issues regarding Angel's aloofness (taciturn behavior) and Kate's failure to open up - are in the vain of not expressing emotions. Which is what the demon/magical stick seems to bring out in people. I don't like Kate. I hate to sound like a broken record on this but none of it works for me. The only way I can appreciate the character in this episode is to the extent that Kate is representative of Angel's lack of expressiveness? And even then the cringeworthy monologue speech (which admittedly is probably supposed to be uncomfortable) is still terrible to watch. No. Again, I appreciate this episode for the comedy but I think the message was messy. "She thinks you're insensitive. And -- not to bring up the irony --but, consider the source." If this line had not been in this episode I would have literally exploded at the sheer irony of the entire first half. As it is, I still find the whole thing just incredibly silly. Cordelia - Ms. Tact is just saying not true stuff - is upset that Angel didn't say please and thank you? 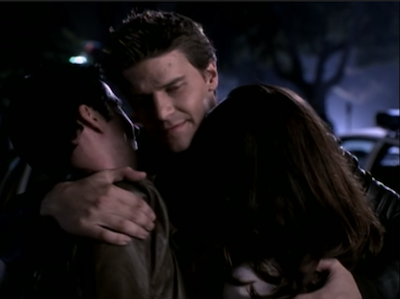 And the Angel hugging Cordy and Doyle and telling him that they judge him when he vamps out. I think that scene is hilarious. Cop through the door: "We're closed." Doyle: "You're the police! You can't close." Cop: "Why not? Haven't we done enough? It's always 'find this, rescue that' with you people. Well, see how you like it!" Cop pulls down the blind hard and rips it off. Angel: "No, I don't think 'urgh' is the magic word, if one would *call* it a word. And even then it's certainly not a magic one." Ok - just alot of funny stuff - I'll stop now. I forget how they were really pushing that Kate/Angel relationship. It appears blatant that Kate is supposed to be this kinda badass who doesn't take anyone's crap. She doesn't quite fit the mold/breaks the rules placed by her cop peer. She also had daddy issues. They seem to be making some parallels between her and Buffy. I really want to like her - I feel like I should like her and often times feel guilty for not liking her. And they basically go on a date in this episode. I wish they had found someone that DB had more chemistry with. There is something off about their dynamic which I just can't place. Either way in a few episodes when Buffy comes in it becomes abundantly clear how bad the chemistry is with Kate in comparison. I have always wondered about the stenographer/court reporter going down to the police station to take down everything that is said. I wonder if that happens. I don't practice in criminal law but it seems rather excessive. But I'm sure firms of W&H's caliber have Court Reporters on staff. I don't know if anyone else had ever been puzzled by this beat but I had. your audience in their underwear? She slides a glance up and down Angel's body. KATE Way ahead of you. I honestly never quite knew how to read that but I'm glad I was right and she was flirting - albeit strangly flirting. Really not much here. Everything else matched up pretty much word for word. I wish I could find this interview - I'll keep looking around. It may have been a podcast I listened to with Tim Minear. But he talks about how in his original script (this isn't in the script I have) he had Kate's dad come in at the end and say something nice and appeasing to the effect of "don't worry about it" something heartwarming. And Minear said that Joss scrapped it. He told him, that isn't how these shows worked. And that's when Tim said he understood what Joss was all about. In any other show, the dad would come in and there would be a resolution - but not in these shows. Which I thought was an interesting insight into Joss' writing style and I agree it elevates these shows above the others like Charmed etc which try and resolve most conflicts at the end. 3. Anything stand out on rewatch? I'm not even going to try to write more questions for this one. Emote at me, people! the "show" and not the " tell;"